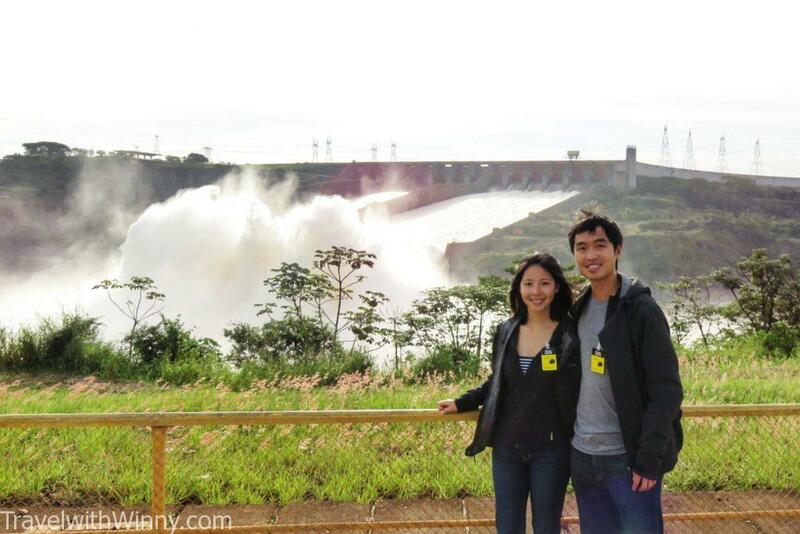 When Winny and I were in the town of Foz do Iguacu to see the Iguazu Falls, we also wanted to visit this Itaipu Dam which is now voted to be one of the “Seven Wonders of the Modern World.” It is one of the biggest hydroelectric dam in the world producing more than 14,000MW of power, supplying over 85% of the power required in Paraguay and 17% of the power required in Brazil. Standing in front one of the Wonder of the Modern World. That power supplies over 50 million people with electricity over the two nations, a number that is twice the total population of Australia. This hydroelectric dam supplies all the electricity required in the two major cities of Brazil, Rio de Janeiro and Sao Paulo. To produce the same amount of energy required as this hydro-electric dam, Brazil will have to burn more than 434,000 barrels of petroleum a day. 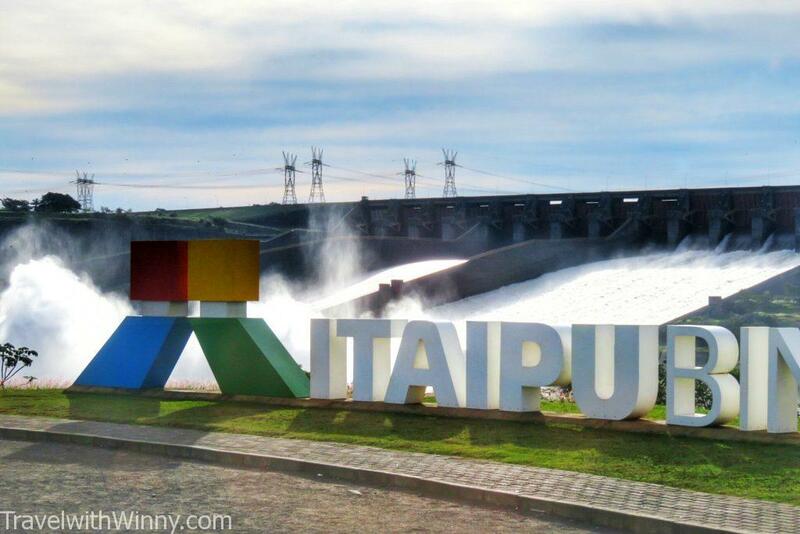 Welcome to Itaipu Dam with spillway in the background. 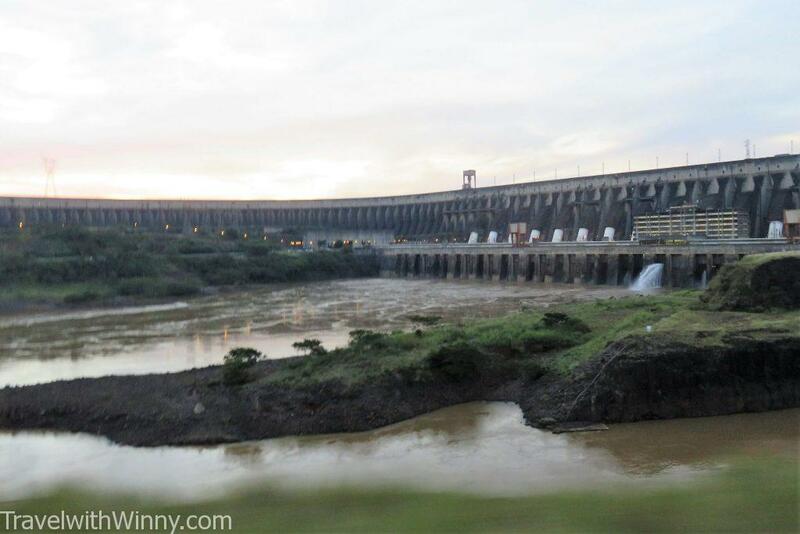 The Itaipu Dam is built on the Paraná River which is a river that is located on the border of Brazil and Paraguay. Serious negotiations began between these two countries began in 1960 when Brazil required more energy to sustain its ever-growing population. The official document “Ata do Iguaçu” was signed by both governments in 1966 but the official construction didn’t start until 1971. 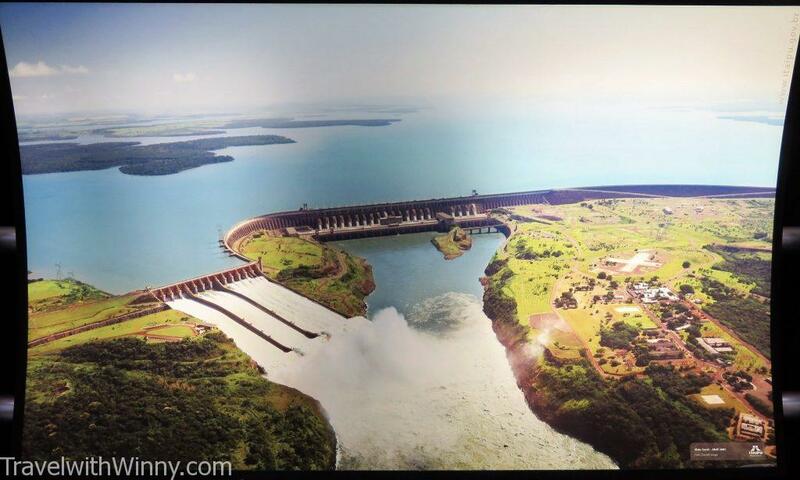 An image of Itaipu Dam from above, taken from one of the photos on site. Construction of this mega-dam took over seven years to build with 40,000 workers. The finished product was a series of 4 dams (Concrete wing dam, main concrete dam, rock-filled dam and earth-filled dam) that is 7.9KM long and 196M tall. There was enough steel in the dam to build 380 Eiffel tower and there was enough concrete to build 15 “Chunnel” that joins England to France. 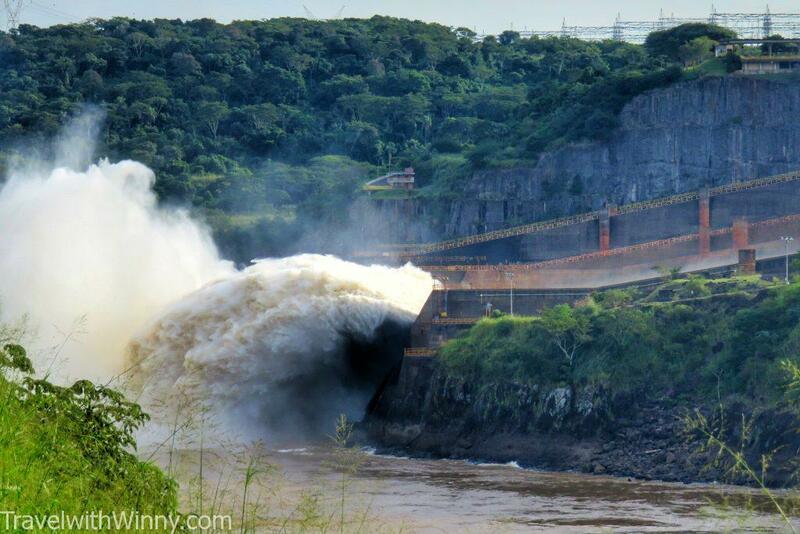 Have always wanted to see Itaipu Dam in real life after watching National Geographic documentary on Mega-structures! Building the Itaipu dam also came with a high price. More than 10,000 Families had to be relocated to their homes and farms will be flooded. Thousands of acres of rainforests will also be submerged underwater. Animals that live in these lands will drown if they were not relocated in time. This area of used to have an abundance of wildlife. The dam will also submerge one of the most spectacular waterfalls in the world- the Guaira Falls. The Guaira Falls was twice the height and twice the flow of Niagara Falls. The Guaira Falls was also blown by dynamite to make safer navigation in the artificial lake, making the damage irreversible. 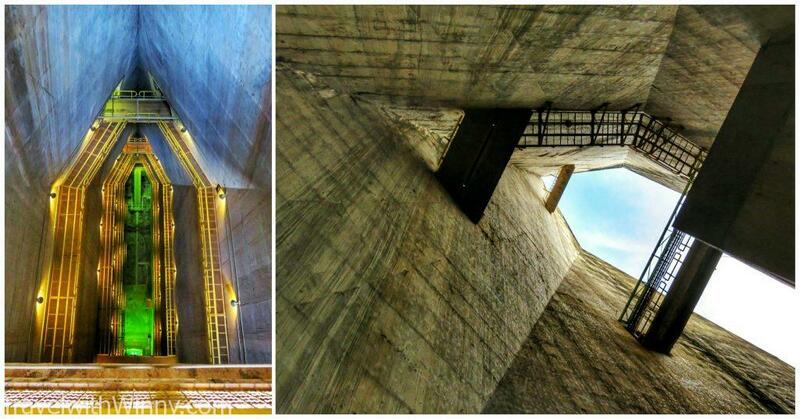 Looking at the cross-section of Itaipu Dam. Maximum of 62200 cubic litres of water can flow down the spillway of Itaipu per second, which is significantly more than the total flow of the Iguazu Falls which is around 15000 cubic litres per second. Just 2 of the 20 Itaipu Dam’s electric generators can release the same amount of water as the Iguazu falls. This is impressive considering that Iguazu Falls is one of the biggest waterfalls in the world. Only open 10% of the year, we were very lucky to witness the open of spillway. On our tour, we were taken to a lookout that is 2.5km away from the Dam and this dam was looked absolutely spectacular. Due to a few days of rain prior to our tour, the spillway was partially open allowing the increased amount of water to be released. The spillway is only opened around 10% of the year so we were extremely lucky to see this view. 4 million litres of water per second was running down that slope on the spillway that day which was twice the amount Iguazu Falls. The view of this Spillway was extremely spectacular. Water is forced on an angle at the end of the slope so the water pressure is spread into the air and would not damage the base and structure of Itaipu Dam. 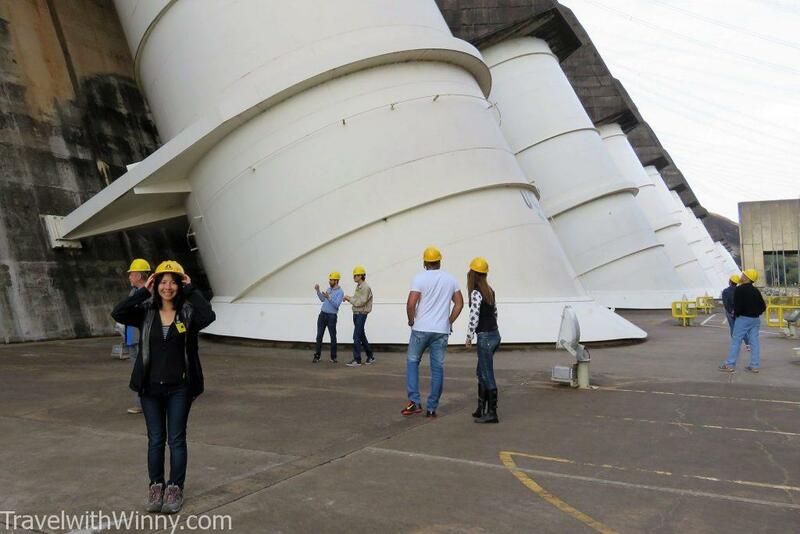 During the tour, we also visited the top and the bottom of the Itaipu Dam so we could see the body of water behind the dam and the impressive structure of the dam up close. The total area of the Reservoir is 1,350,000 Square Kilometres and there is no end in sight to this artificial lake. The main concrete dam is roughly the same height as a 65 story tall building stretching 2.5km long. We were miniature standing next to this mega structure. We were also brought into the heart of this dam which was the generators and the control room. 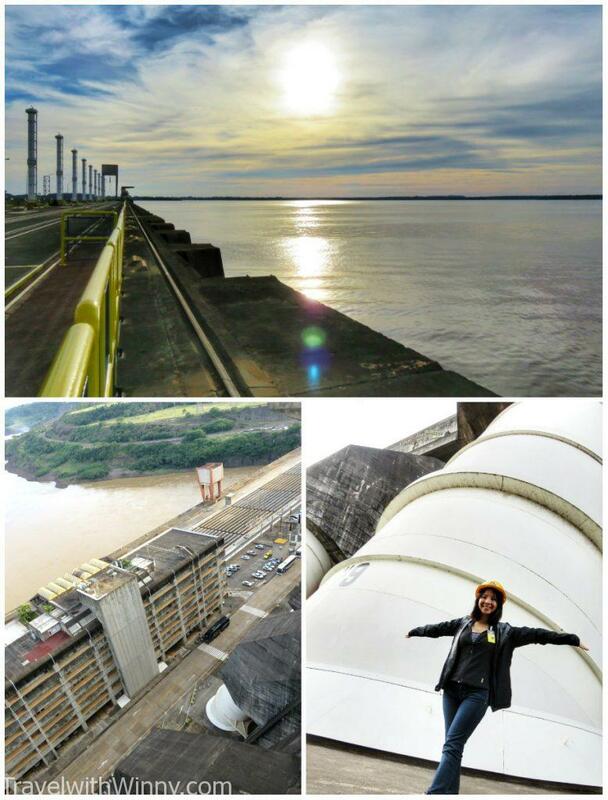 During the tour, we get to see Itaipu Dam from different heights and directions. 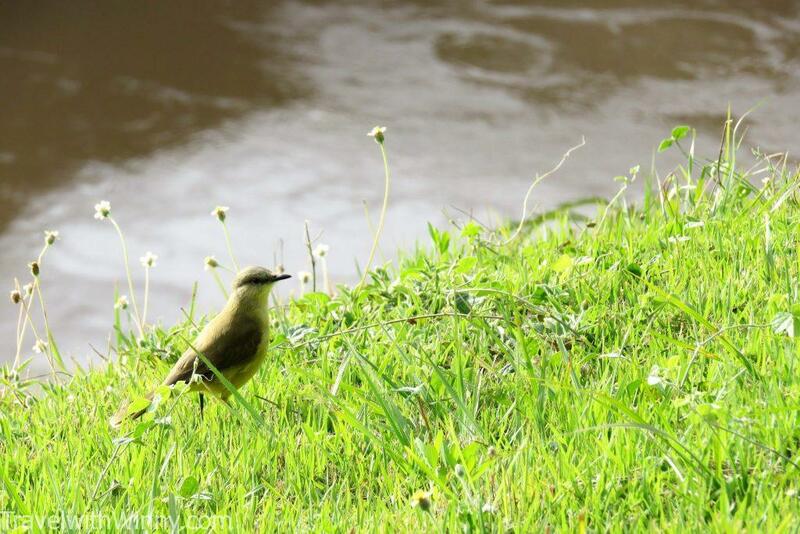 The ownership of this dam is 50% Brazilian and 50% Paraguay. The number of people employed to work here is 50/50 as well. Even the control room is divided this way. 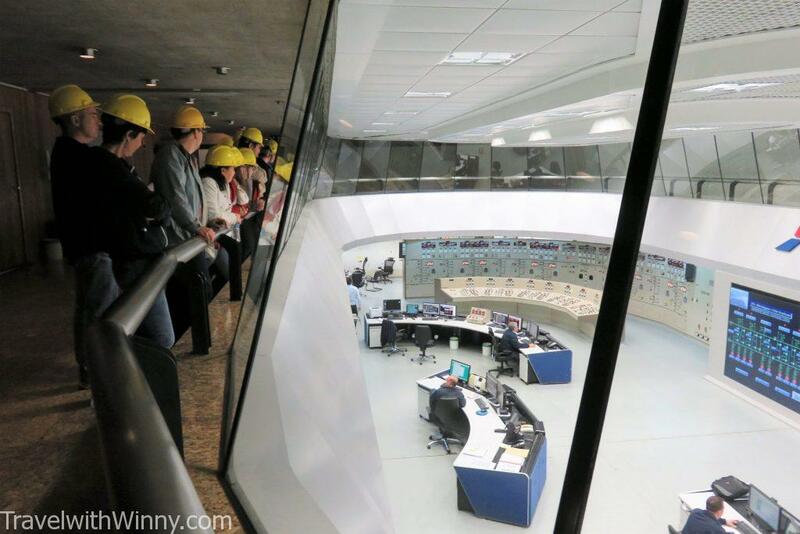 The director that controls the function of the dam in the control room alternates between the two countries. Looking down into the control room like ones seen in the movies. Technically we did step into Paraguay today. As the treaty signed between the two Nations, the amount of electricity produced at Itaipu Dam is split evenly too. 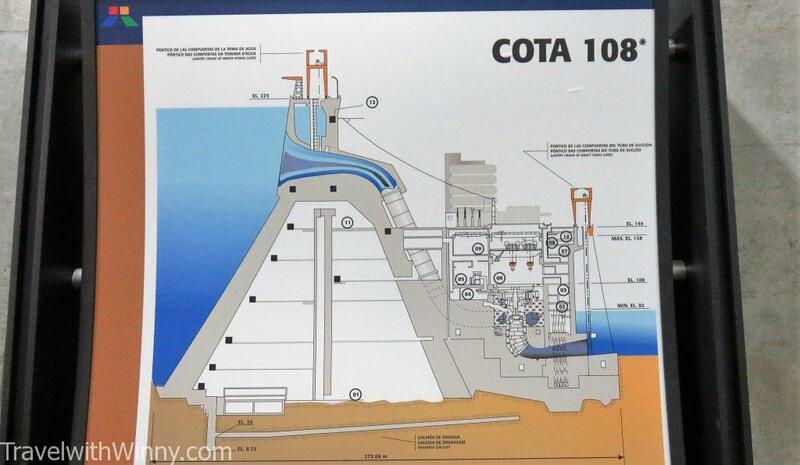 Half of the generators in the dam produces 60Hz for Brazil and 50Hz for Paraguay. Today we actually visited Paraguay by crossing the border inside the dam. As Paraguay do not require all their share of electricity, a treat signed between the two nations binds them to sell the majority of electricity produced in their generators directly exported to Brazil. Currently, Paraguay only uses 7 million MWh per year and must sell its remaining 38 million MWh to the Brazil. Paraguay is quite discontent with this treaty. They are bound to sell all their unused share of energy solely to Brazil at an extremely discounted price. Apparently, there was quite a few scandals and corruption involved which caused Paraguay to sign such an unfavourable treaty. This treaty expires in 2023 and Paraguay is looking forward to changing the treaty which is extremely unfair to them. 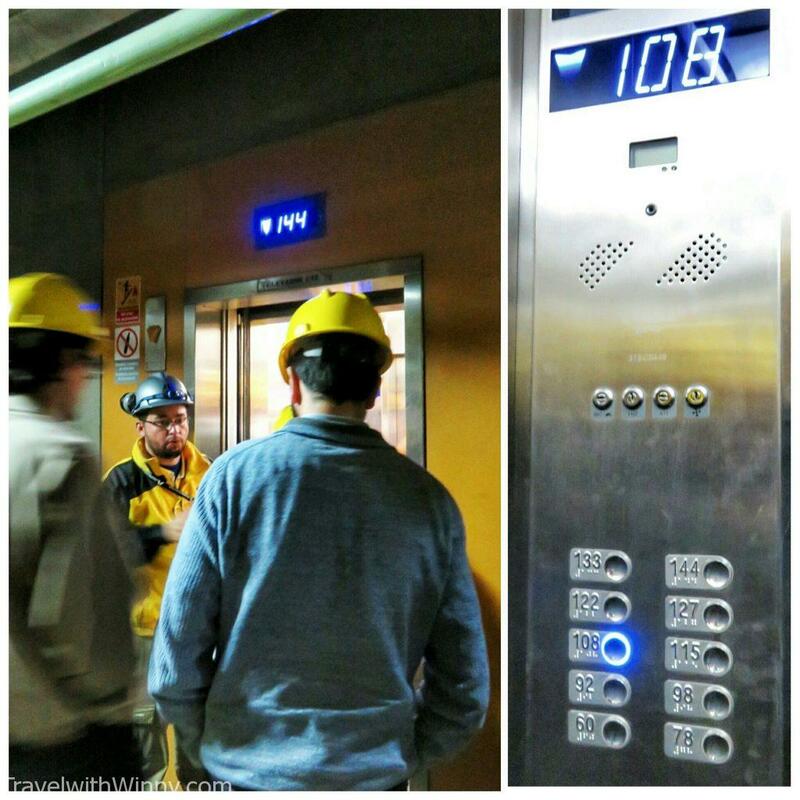 We are now in an elevator heading 108 meters below sea level. We were brought to an interesting elevator which uses “meters above sea level” to mark the different floors levels in the dam. At first, we thought there were more than 100 levels in this dam. 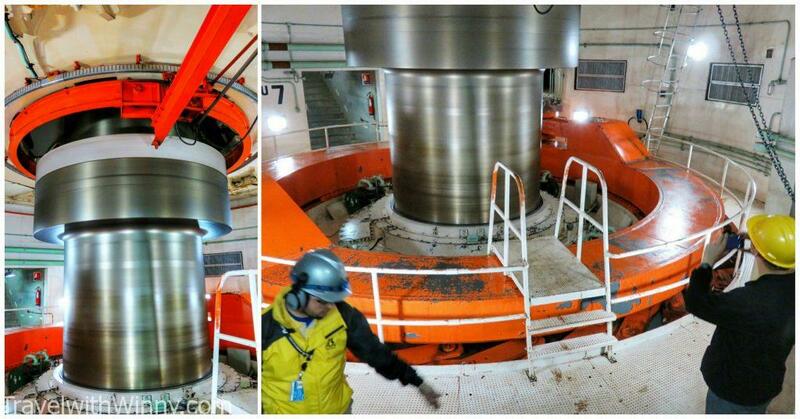 We were taken to see the generators which were at an impressive size and each unit weighs around 900 tonnes. Many of the generator parts weigh more than 100 tonnes and were manufactured across many places in Brazil by many foreign companies before transported and assembled here in Itaipu dam. Massive generators oscillating at extremely high speeds to produce electricity. There are 20 generators in total in Itaipu dam with the last generator only installed in March 2007. Only 18 of the 20 generators are allowed to be operational at one time due to a diplomatic settlement signed with Argentina. During the period when the Itaipu Dam was constructed, Argentina was concerned that in the event of a conflict, Brazil can open up the dam and flood the capital city of Argentina, Buenos Aires. As a result, Argentina only allowed Brazil and Paraguay to construct a dam with 18 generators. Ironically there were still 20 generators constructed but the numbering of the generators has to end with 18 and the last two generators were numbered 18A and 18B. Looking at the reservoir of the dam from up close. Winny and I had a very insightful tour of this impressive mega structure and it opened up a whole world of curiosity to the hydroelectric dam. We even went home and watch two documentaries of hydroelectric dam construction. Visiting the Itaipu Dam was one of our highlights in Brazil and we highly recommend this place when people visit the Iguazu Falls on the Brazilian side! 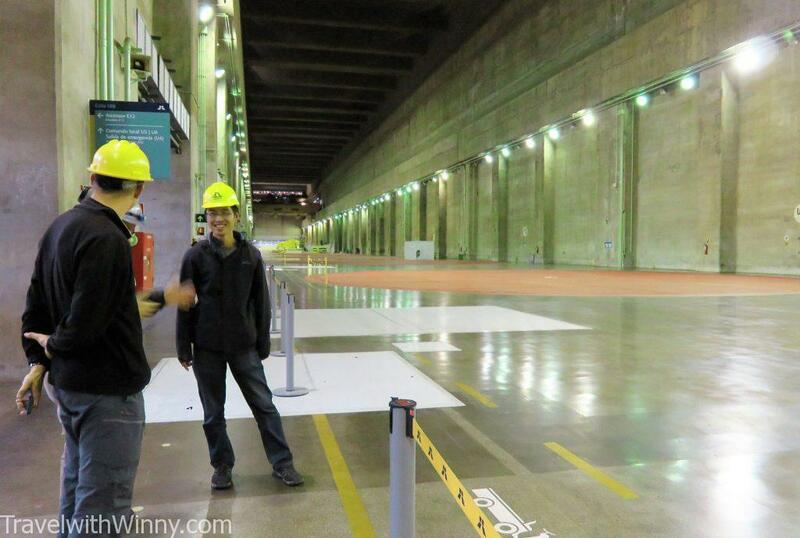 Inside one of the floors learning more about Itaipu Dam. 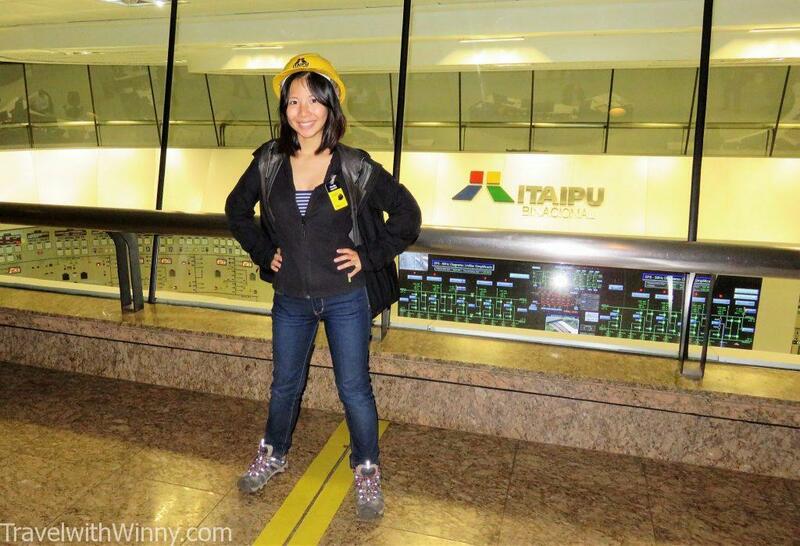 To visit Itaipu Dam, you can check and purchase a tour ticket online on their official website. Purchasing a tour prior to arrival may be a good idea as some tours can be sold out at set times. There are many tours available but the most worthwhile tour to join is the “Special Tour” which brings you to the heart of the dam with a guide.